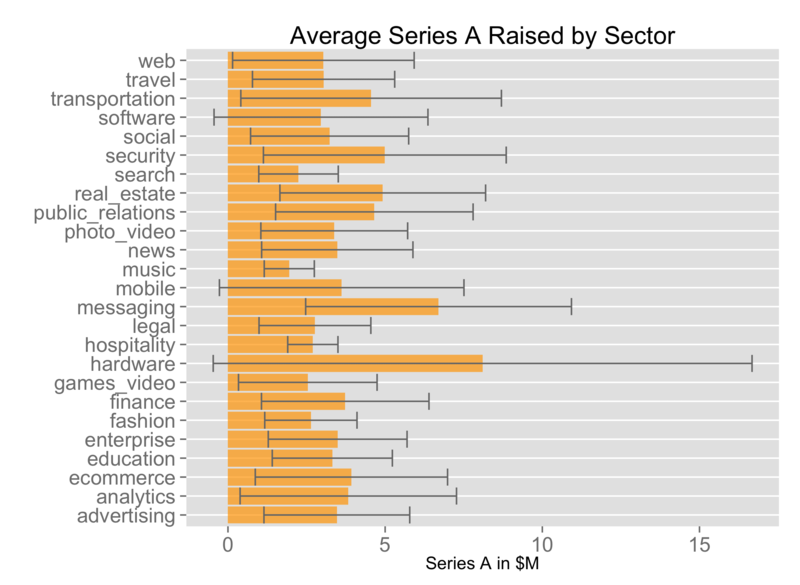 The average seed stage startup has a 20% chance of raising a Series A according to Crunchbase data for IT startups who raised seed and Series A rounds between 2006 and 2013. But this figure varies significantly sector by sector. 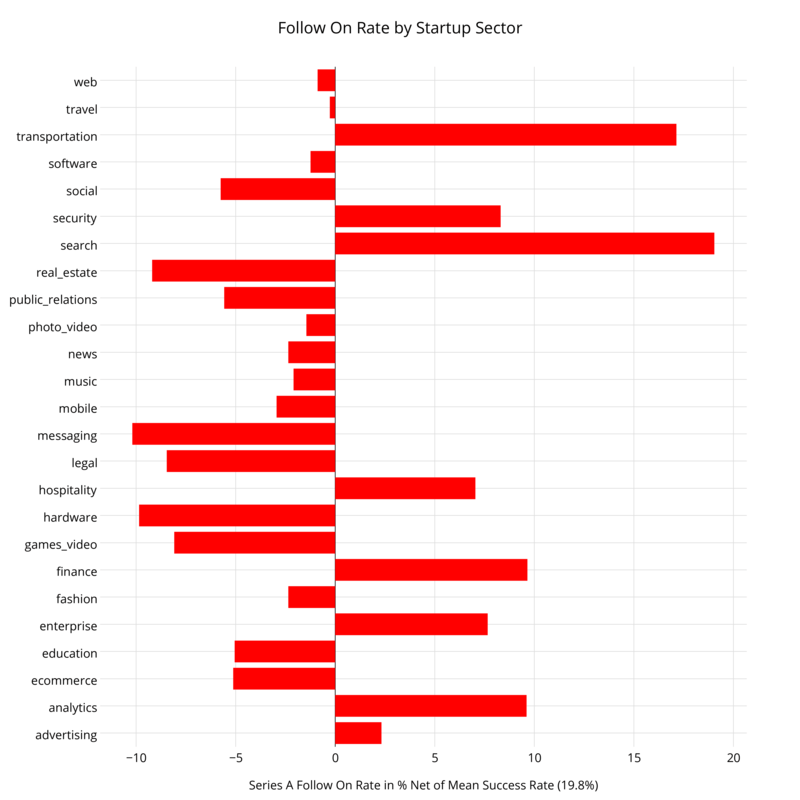 Below is a chart of the different startups’ sectors and their rates of raising Series A capital net of the mean of 20%. To contrast two diametric examples, 40% of seed-stage search startups raised Series As, while on average only 10% of hardware startups raise Series As. For an interactive chart, click here. Search, transportation, finance and analytics startups have the best rates of Series A financing. On the other hand, startups in the messaging, hardware, real estate and legal sectors have a much harder time, typically about 50% worse than the average company. Web and Software effectively equal the average because they are the most broadly applied tags. Since search is the best business on the internet, I’m not surprised by the high follow-on rates in that sector. Uber’s succcess has spawned a handful of similar businesses, driving the transportation category. Finance was quietly booming, but since Bitcoin broke 1000:1 USD:BTC exchange rate, financial innovations are hard to miss. Analytics is likely the catch-all for big data. The startup sectors facing a harder road to Series A rounds are either competing in vibrant and fiercely competitive sectors (messaging), capital intensive sectors (hardware), or sectors that require some rarer expertise to understand (real estate and legal). Interestingly enough, most of these seed stage companies raise similar size Series As. Only hardware companies raise substantially more. But there are very high variances in the data set, as indicated by the error bars. The usual caveats apply in this analysis about the noisiness of Crunchbase data. Also, because we don’t have knowledge of how many fund raising processes each of these startups attempted, we can’t make meaningful comparisons over time or establish much in the way of causation.